Many Christians have a complicated relationship with the Song of Solomon, or Song of Songs as it’s also called. They skip it when reading through the whole Bible, ignore it in study, and struggle to explain what it’s doing in scripture. Even the idea that the Song is an allegory for the love between God and His people and/or Christ and the church (the dominant interpretation for thousands of years) has been largely abandoned by modern Bible scholars. In Jewish tradition, the Song is associated with Passover (Pesach) and is read at this time of year. Some say this is just because the song references the spring season. But other rabbis describe this book as the “holy of holies” in the canon of scripture. They accept as a matter of fact that “Israel, in it’s covenant with God made on Mt. Sinai, was married to God” and the people owed Him their “absolute fidelity” (quotes from “Why Do We Sing the Song of Songs on Passover?” by Benjamin Edidin Scolnic). This assumption explains why the prophets speak so often of Israel’s unfaithfulness to God as marital infidelity. In reference to Hosea, Gerson Cohen said this was “because his Israelite mind had been taught from childhood to think of the relationship between God and Israel in terms of marital fidelity, in terms of love” (quote from “The Song of Songs and the Jewish Religious Mentality”). The Song of Songs might be the most explicitly romantic book in the Bible, but it’s certainly not the only time romantic imagery is used to teach us something about the relationship between God and His people. The Apostle Paul (also a Jewish rabbi) even said after giving instruction to human husbands and wives that “this mystery is great, but I am speaking with reference to Christ and the church” (Eph. 5:32, LEB). So what does all this have to do with Passover? For some writers, the Song actually functions as a midrash on Exodus — a commentary in the form of a poetic, figurative retelling of the Exodus story. With this interpretation, “the Song of Songs, according to the rabbis, is a text which describes the very events that Pesah celebrates and commemorates.” You can read more about this viewpoint in Scolnic’s paper (click here). If you read the post from two days ago, then you know I already touched on unreasonable expectations in my post “5 Relationship Problems INFJs Often Struggle With.” Those of us (not just INFJ types) with particular romantic ideals and good imaginations might struggle with it more, but the issue of romantic hopes and dreams not matching reality affects everyone. As de Botton says, if you’re human you’re hard to live with. But he also says most of us are blind to the hows and whys. That might be true, but as someone who lives with anxiety I’m also quite certain I’m not easy to live with. I might not know everything that’s wrong with me. I’m probably missing some of the real reasons that I’m hard to live with and have blown other things out of proportion. But my anxiety tells me over and over again that there’s something wrong with me and people won’t, or shouldn’t, want to be around me. The way de Botton phrases this bothers me because I know that living with the idea “I’m appalling/ broken/ worthless” isn’t healthy, psychologically. I think the goal should be to arrive at a more balanced view of yourself. 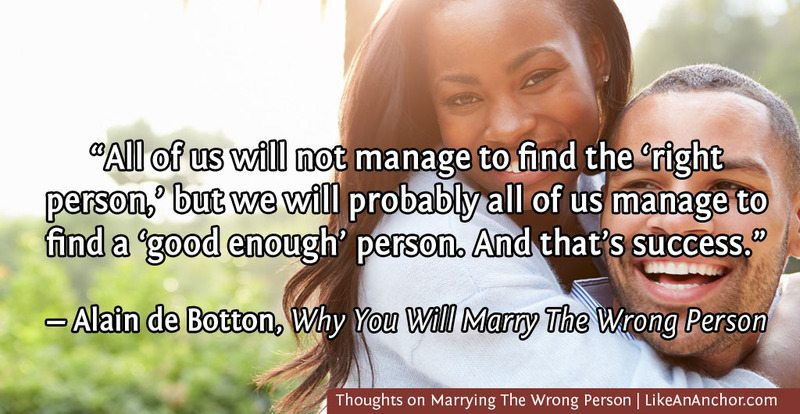 Maybe de Botton thought most of his audience needed to be told they’re appalling to help get them closer to balance, but I also think there are people who hear “you’re appalling” way too much (from self and others). What we really need to hear is that we’re worthy of love even though “in everyone, and of course in ourselves, there is that which requires forbearance, tolerance, forgiveness” (to quote C.S. Lewis in The Four Loves). I’m a big fan of Brené Brown and love the work she does on shame and vulnerability. I know vulnerability is a vital part of human connection and I believe that it’s a good thing. 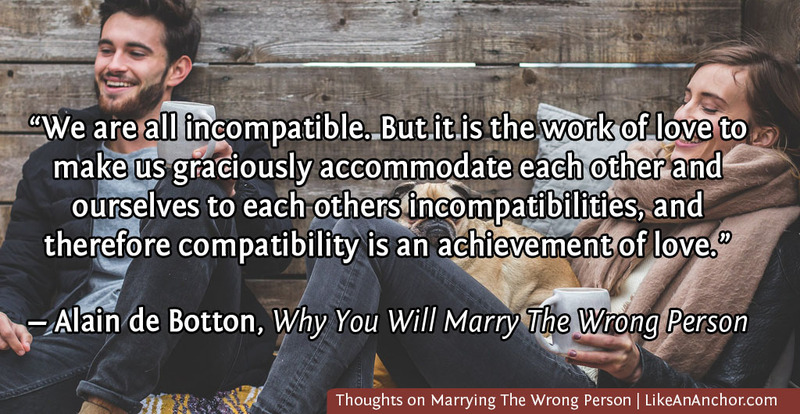 Still, the part of de Botton’s talk where he discussed the vulnerability needed to create a good romantic relationship bothered me. I’m not sure about this one. Yes, extreme vulnerability is needed to build relationships, but I’m also wondering isn’t it better to approach a relationship from a place of I could survive without you, but I really want you in my life rather than I desperately need you? Although, to be fair, he probably isn’t talking about the kind of “need you” that goes along with something like insecure attachment styles. I also wonder if my qualms about this part of his talk might be more about some of my personal experiences and my fear of being seen as “clingy.” I don’t want to say ‘I need someone’ while I’m single because I don’t want to be that person who’s just all wrapped up in finding a relationship. Even in a relationship, though, I don’t want to say ‘I need you’ because it feels like weakness. I really do feel like I’m a small child inside and I need someone, but there’s also part of me that hates this side of myself. But shouldn’t asking for what we want and need feel like (and be) something that’s okay to do? I suppose I’m going to have to (somewhat reluctantly) agree with de Botton on this point. I do really like de Botton’s description of love as a skill that needs to be learned. It’s a sad thing that in the world today we’re constantly told love just “happens” or that it’s all about emotion. If that were the case, romance should be pretty easy but it’s not. And because we don’t think of love as a skill or something that requires hard work, we keep trying to find love that “feels good” or where we’re magically compatible. It’s no wonder that we’re continually disappointed. Love is about so much more than just how we feel. It is an action and a choice. This reminds me of one of the questions that comes up quite often in the personality type community: “Which type is a good fit for me romantically?” The often unsatisfying answer is “any of them.” Oh, there are some types that tend to get along better with each other but type really isn’t a good predictor of which relationships will work out. It’s much more important to find someone who will work to understand you and whom you’re willing to work to understand than to find someone of a “compatible” type. I’ve been pondering this part of de Botton’s talk for days. Is it true in general? Is it true for me? It reminds me of something my ex-boyfriend said about what I think I “deserve” in love, which I don’t want to go into detail about but has been bugging me since he brought it up. I don’t have an answer as to whether or not we’re looking for lovers who will hurt us in all the ways that feel familiar from other people we’ve loved. However, I do think that as a general rule often times what we’re looking for romantically isn’t necessarily what would be best for us. This goes back to the idea that we’re looking for someone who will just accept and understand us, when in reality we all have parts of ourselves that are hard to live with. We should really be looking for someone who will help us become a better person and with whom we can build compatibility (more on that in a moment). I think you should look for someone who loves who you are so much that they want you to grow into an even better version of yourself. They’ll also want you to do that for yourself as much (or more) than they want you to do it for them. I want to make sure and note, though, that this is a very different thing than someone who tries to manipulate and/or change you “for your own good.” No other human being has the right to decide what’s good for you or mold you into something you’re not. Someone who really loves you will help you grow as yourself, not make you change into what they want. I absolutely love this perspective on love and compatibility. Love is so much more than something we find or fall into. 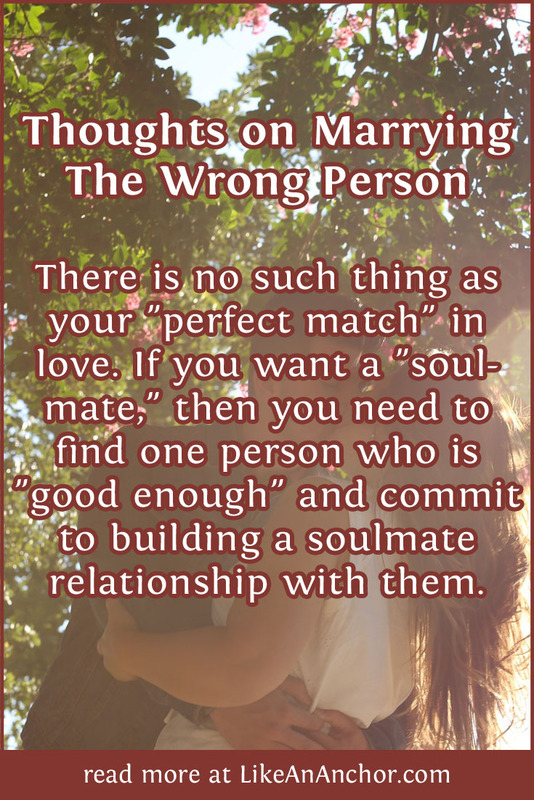 If you want a “soulmate,” then you need to find one person who is “good enough” and commit to building a soulmate relationship with them. I should never have stayed here. Nay, I should never have left Italy. If my cousin Philip had not been so like Ambros perhaps I could have left. To see his face — that beloved, tormenting face — staring into my eyes once more was more than I could leave. More than I could resist when he asked me to stay. Or I should say ordered me. They were orders, though I turned a blind eye to it then because I wanted him. Or perhaps not him, but Ambros back in my life. I know not. I’m in such fear. It was a foolish thing on both our parts, the midnight of his birthday. He knows too little of the world to realize what I gave him was nothing more than a thank you. A birthday gift that would mean more than that stupid little pearl cravat pin. And yes, I wanted it too. A younger, more devoted Ambros to worship me once again if only for a moment. And how could I have known that he meant marriage by his comment about lacking warmth and comfort? Or that he thought I’d agreed to be his when he took me into those primroses? Or that he would get so drunk he’d announce our engagement to his godfather and poor Louise at dinner? I still feel the pressure of his hands at my throat. Those big, powerful hands of a man who works on his farm every day and stands a head taller than me. Stronger than the ones Ambros once put around my neck. My cousin Philip could have snapped my neck, though he wouldn’t have had to. The slightest squeeze more and I’d not have been able to draw the thinnest breath. Should I feel guilty for bringing Mary Pascoe into this house? Surely his fury won’t touch her, too. The worst he’d do is throw her out of the house. While me … I know not what he’d do were we alone now. Would he wrap his hands around my throat again and expect me to make myself his? Would he force me and afterward tell me I liked it and must marry him? His fantasy is as complete as the paranoia that claimed Ambrose. I half-believe in his mind we’re already married. That he thinks I’m so sure to agree it’s as if I’ve done so already. That his ridiculous present of his entire fortune will surely convince me to stay. Did he think he’d bought me? Will he let me leave? This is quite a bit different than my usual review for books I’m reading on my Classics Club Book list. 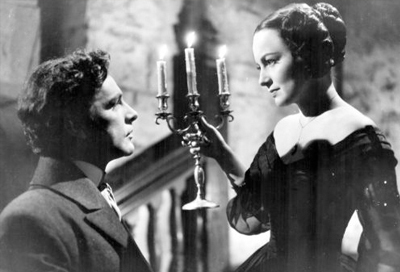 But I think Daphne Du Maurier’s My Cousin Rachel (1951) is the sort of novel that invites you to look at it from different perspectives. The fact that you’re trapped inside Philip Ashley’s mind for the entire novel leaves you guessing at what the other characters are really thinking. He’s an unreliable narrator and he’s hopelessly naive, especially when it come to women, so the motives he assigns to Rachel are likely untrue. But if he’s wrong about her, then what is right? Everything we know of her is filtered through Philip. We don’t know her true motive or any of her thoughts. We can only guess, as I’m doing in my little retelling from Rachel’s point of view (which overlaps Chapter 23 of the original novel). 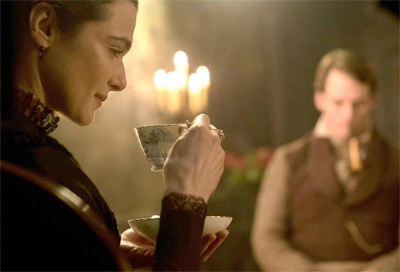 I watched the 2017 film adaptation of My Cousin Rachel before reading the book. I suspected I would still enjoy the book after seeing the movie, but knew if I read the book first there was a good chance I’d spend the film grumpy about how they’d adapted it. It turned out to be a very faithful adaptation, though. *Spoiler Warning* The only major changes were made at the end. The film provides less evidence of Rachel’s alleged guilt, pointing viewers towards the idea that she was not poisoning Philip. And it also has Philip sending her to ride along a dangerous path rather than choosing not to warn her about a dangerous bridge in the garden. The film pushes you toward believing he intended her to die where the book leaves it a little more ambiguous. But then again, Philip’s the one telling the story. Of course he’d make himself look as good as possible. 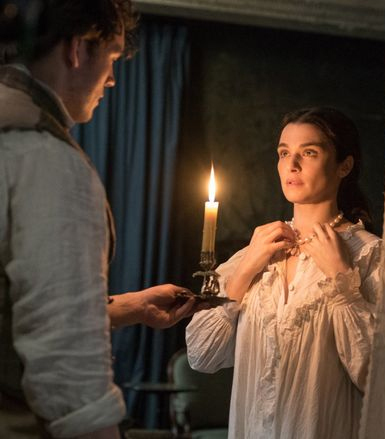 Philip wants us second-guessing his cousin Rachel. But I suspect Du Maurier wants us to look at Philip just as closely. Because even though we’re getting his perspective on things and he’s certainly not putting any blame on himself, there are things about being in his mind that make me as scared of him as I think Rachel is. Repeatedly, Philip says he wants to isolate Rachel from everyone but him. And that’s before he starts becoming overtly controlling. And when he puts his hands around her throat, it’s not in the heat of anger. He presents it as a calculated decision to add fear to the list of reasons she should marry him. Later, he barely contains his fury and indignation when (after he’s given her all his property and she still hasn’t married him) she states that she can and will invite whoever she likes to stay with them because the house belongs to her and she doesn’t feel safe alone with him. So instead of just asking, “Did Rachel poison Ambros and/or Philip?” I think we need to ask whether such an act could be considered self-defense. Abuse does not justify murder, but even if Rachel killed someone she may not be the evil and/or misguided character that Philip (who describes himself as feeling a strange compassion for her once he makes up his mind about her guilt) makes her out to be. It might have been more of an act of desperation and fear than calculating malice. But that’s assuming she’s guilty at all. And there’s no clear evidence that she is. Laburnum (the plant Philip settles on as the murder weapon) isn’t even all that poisonous. The most common symptoms are nausea and vomiting, and that’s after eating several seeds. “Higher doses can produce intense sleepiness, convulsive possibly tetanic movements, coma, slight frothing at the mouth and unequally dilated pupils. 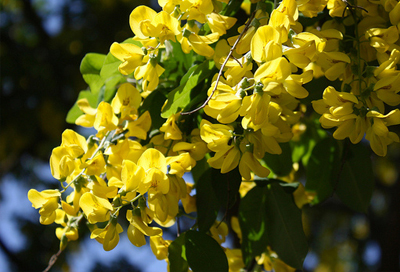 … [However] the MAFF publication ‘Poisonous Plants in Britain and their Effects on Animals and Man’, says that all stories about laburnum causing serious poisoning and death are untraceable” (The Poison Garden). There’s an argument to be made that Philip isn’t really concerned about whether or not Rachel poisoned Ambros at all. 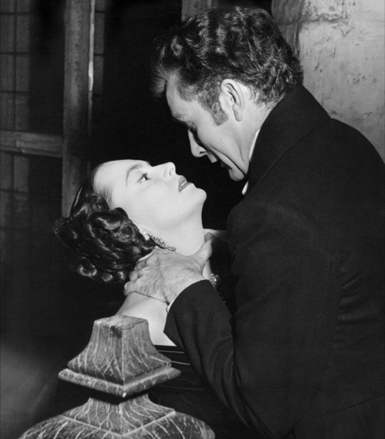 He decides her guilt based on whether or not she “conforms to his desires and whims” (from “My Cousin Rachel (2017) and Male Entitlement“). After all, he already possesses everything else that belonged to Ambros. Why not Rachel as well? The question of whether or not Rachel poisoned Ambros consumes Philip only until their first meeting. After that he’s quite certain she’s innocent until she makes it clear she won’t marry him. All his worry about whether or not she’s guilty of murder covers the fact that his inability to deal with rejection brings out a desire to posses and control her. He and Ambros call Rachel “my torment” because she brings out the ugliest side of their natures and they blame her for their darkness rather than looking to the true culprits. Themselves. 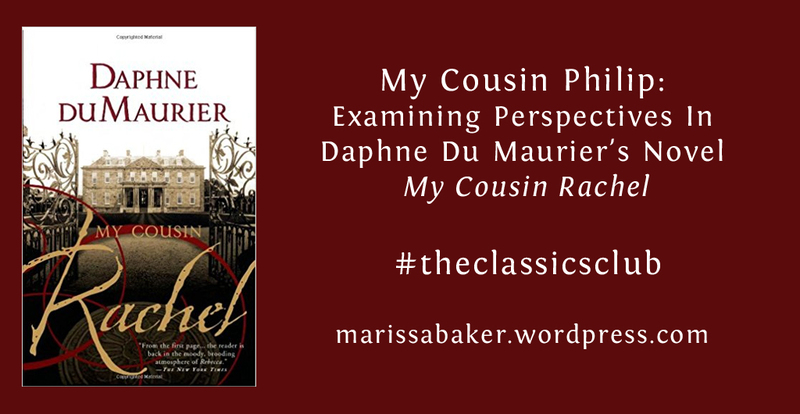 Click here to get a reading copy of My Cousin Rachel , and here for the movie . Please note that these are affiliate links. This means that, at no additional cost to you, I will receive a commission if you click on the link and make a purchase. As I’ve mentioned once or twice before, I have something of an obsession with tall ships. This is probably a result of my love for stories set during the Age of Sail. 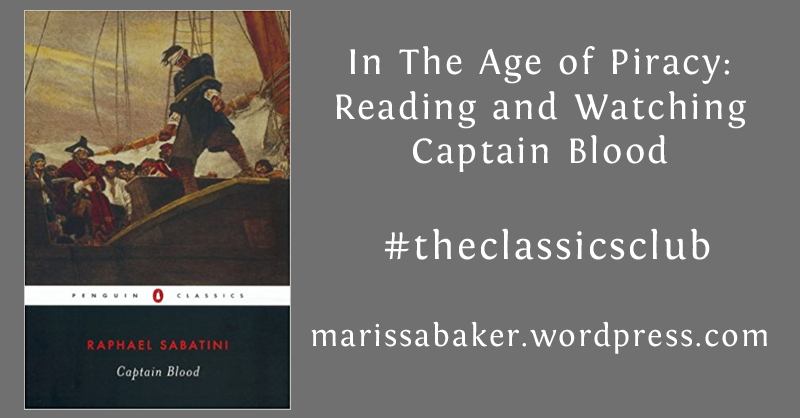 One such story is Captain Blood by Rafael Sabatini, first published in 1922. This book wasn’t on my original Classics Club list. I’d already read it and hadn’t intended a reread, especially after being disappointed by Sabatini’s Bardelys the Magnificent. But I ended up with a digital copy on my phone a year or so ago and started reading it while in a waiting room. So of course I had to finish it — one simply doesn’t abandon an adventure novel in the middle of the story. I’m (once again) in the midst of a pirate obsession, for which we can thank the recent release of Daughter of the Siren Queen (sequel to my 2nd favorite novel of 2017, Daughter of the Pirate King). So I started reading a book on the history of pirates in reality and fiction, which prompted me to watch the 1935 version of Captain Blood. And that brings me to my decision to write a post for the classic novel.